Smile is a curve which sets everything straight . It’s the prettiest thing one can wear. A smile is a window hiding untold feelings. Here I’m neither trying to be an optimist nor delivering a tedious harangue. When I thought of writing my third blog a man had pranced into my thoughts .If I have to speak about BVRIT , I should probably start it with this gifted person .so who is he ?? where do we find him???? 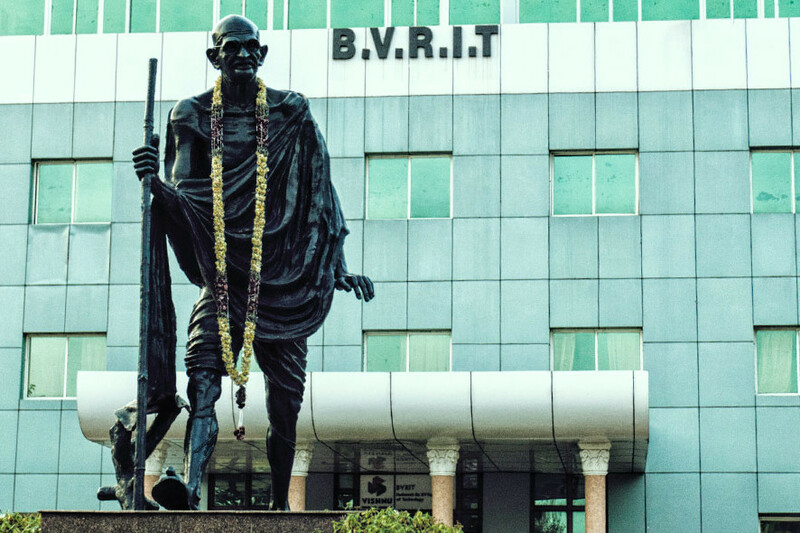 The straight road laid between the two whopping gates of BVRIT , takes us to a short & thin man with a stick in his hand and an endearing smile ,welcoming us all with his open arms . smile is the only ornament he wears.He is the man with tranquility , solitude & seclusion. His strength comes from his indomitable will. He has the power & courage to lead this entire nation . 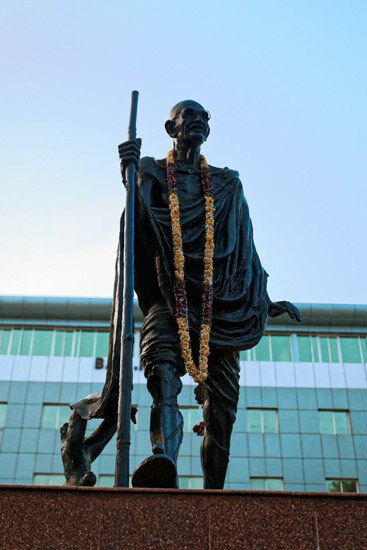 yes , you are right , I’m speaking about Bapuji – our Gandhi statue. 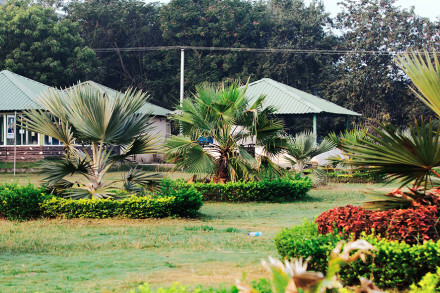 Gandhi statue – a dark grey colored idol of Gandhi with his right leg stepping forward is carved in such a way that if we stare two minutes at this idol , we feel that he is really standing right in front of us .In the entire campus this has become one of the most favorite hangout places for every one of us. Every event that takes place in our college or every marathon will have this Gandhi statue as a starting or finishing mark .Adding to this there are many hidden secrets about this idol. There is a reason behind specially casting Gandhi among many other leaders of his era. Well , our founder chairmen DR. B.V.Raju sir was born during the era of independence struggle. He had been influenced to a symbolic leader like Mahatma because of his unblemished record as a selfless leader, a true patriot, who was a national builder above all else. Gandhi was not aligned with any political views other than believing in a democratic India. Gandhi is the reincarnation of earlier Indian nationalist leaders as a demigod. All these qualities of mahatma had left a mark in our founders thoughts which resulted as a seven feet idol of mahatma in the center of our campus. Since we entered into our first year we made him our friend in crime , as he is the only person to witness the students bunking their classes. He is the person who had seen the anxious eyes of fresher’s entering with a zeal & the aspiring eyes of those who leave the campus to enter the real world. He had been with us in every important event of our campus life right from the inauguration till the graduation ceremony .he even enjoyed many annual days and zealotz with us . In short with or without our notice he had always been with us ignoring our silly mischiefs .Without him probably bvrit would be incomplete. He had seen the bud of BVRIT turning into a blooming flower. Let’s take a bow to the inspiring and outstanding personality , to the “ HEART OF BVRIT ”. Gayathri.A is a student from the Electronics and Communication department, BVRIT. She hankers to be a design engineer. She is passionate about writing , singing and photography. In a nut shell she is amicable and applied. Previous storyNothing will work unless you do!